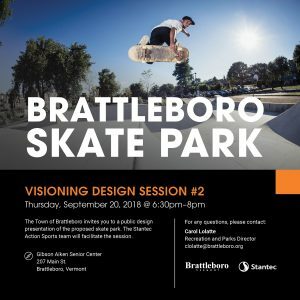 The Second Skatepark Design Meeting is scheduled for Sept 20th @ 6:30 pm at the Gibson Aiken Senior Center, Main Street in Brattleboro. You are welcome to attend this Visioning Design session with Stantec. Please consider sharing the information with any BMX, Skaters and Rollerbladers you know. I’m expecting a skatepark next summer, and am trusting the skating community to help design the perfect place. Wishing you all well. You are very close.